My first thread. I'm 54 and just picked up riding again on my college 10 speed 30 years old. 'Been picking it up again over last three years. 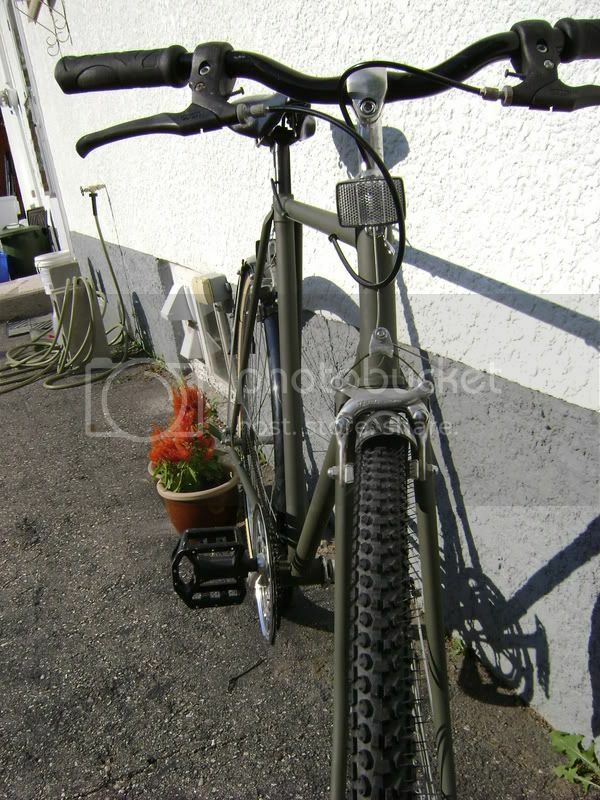 It is so old it has drop bars and two sets of brake levers. It has drop shifters which I do not like. I've nearly always used the brake levers across the top - riding more upright. ' 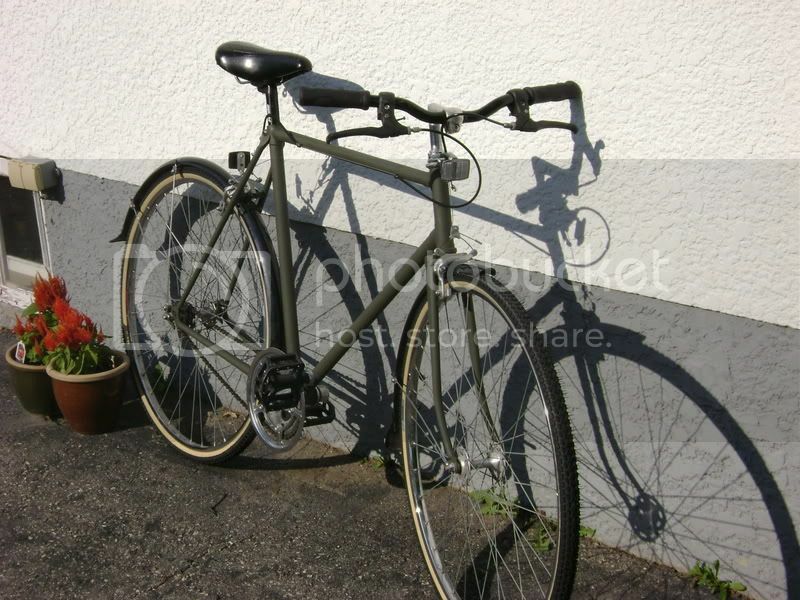 Thinking about a new bike - city/urban style with straight bars. Many of them seem to have lower level components and higher prices. ' Been looking at building my own and it is hard to find a frame or frame set to build a road/city straight bar bike. Mostly I ride around a small town on residential streets and mebbe some paved trails, trips to the store. The geometry on the city bikes seem to have a longer wheelbase and different angles. Regarding wheelbase - is the shorter base a little faster off the mark and easier to handle? Does it create lots of fit problems to put straight bars on a road frame? Perhaps compensate with a longer stem? Just thinking about buying and assembling my own with quality components where I want them - then having a bike shop tune it. Thinking it might be a lot wiser to just go with retail bike. Any and all advice welcome. By the way - small rural town closest bike shop is 45 miles away - part of the reason I'm thinking about building my own. If your old bike has two sets of brake levers, I assume one set is what are known as "suicide" or auxiliary levers pivoted from the brake lever body. From that, I have to assume the bike was of fairly low quality to begin with. An upgrade to modern good quality components plus a bar/stem change will cost much more than the bike is worth. I recommend you consider a good make new Hybrid bike. These have flat bars and will come with modern and, depending on the model, decent to very good components. A shorter wheel base has no bearing on acceleration and may or may not have much effect on handling depending on the rest of the frame's geometry. For the riding you are describing, quick handling and very responsive turning is not what you want as these bikes can be twitchy and require constant correction to keep in a straight line. They are very good for criterium racing but not for recreational riding. Yeah , I was going to purchase all new, but not certain about putting straight bars on a road frame. As the urban/city bike frames are a little longer wheelbase than the same size road bike frame, it sounds like from your response that for my riding needs it would not be the best thing to put straight bars on the shorter road frame. Would you say that is true? 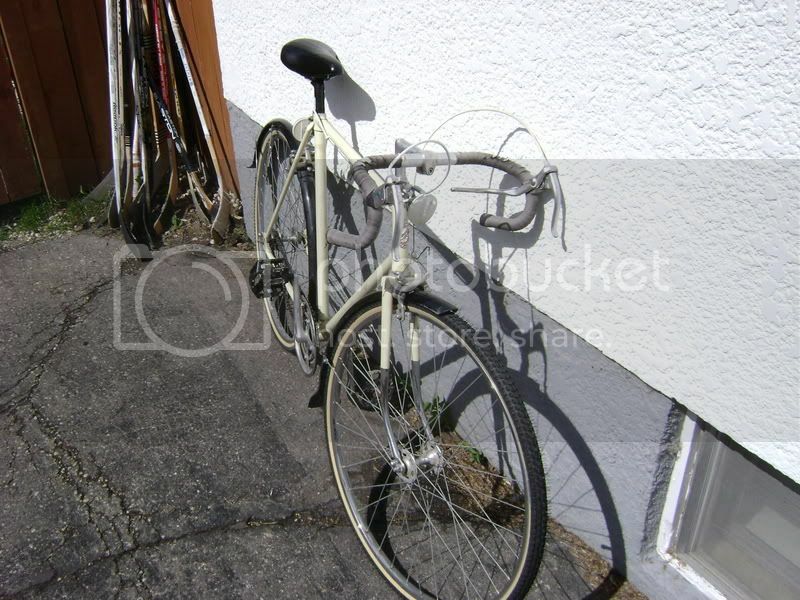 Perhaps it would be better to just purchase a retail urban/city bike that has the longer wheelbase? You can put straight bars on a road frame and adjust the stem length accordingly but, in your case the cost would be more than is warranted by the bike you are starting with. The longer wheelbase on Hybrid/City bikes is partly the result of longer chainstays to clear larger tires and/or allow fenders to be fitted. There is no downside for the riding you intend to do. Last edited by HillRider; 03-18-08 at 11:13 AM. The 30 yo bike was probably of medium to low quality. The brake levers are separate. A "passthrough" lever is at the flat part of the bar and a second set is on down turn on the drop. I almost always use the cross levers at the top. That is why I was thinking straight bars on a road type frame in a city/urban set up. You probably would like to ride in a more straight position than 30 years ago. So, flat bars plus the short top tube will allow you to do it. You should check the clamp diameter, for most flat bars it's 25.4mm. Your stem diameter can be different, then you can use a shim or metal from a tin can. Also, you need cable stops for routing the derailleur cables through the down tube. Shifters are an interesting topic. You have a 2x5 system. You can use some kind of friction shifters. Mountain bikes and some cruisers do indeed have longer wheelbases. They tend to feel a little "slower" to turn as you need a little more exageration to get the bike to respond. It's not any "heavier" just that you need to use a little more. However you may find you enjoy the relative loss of twitchiness. Otherwise there's no rules about flat bars on road bikes. I say try it and if you like it then sell off the drop bar and brifters (brake-shifters) to fund the conversion. Or if you're getting the bike built up by a shop like a lot of road bike places do then you don't need to buy the other stuff in the first place. If you plan on riding in the rain I'd suggest looking at cyclocross or light duty touring bikes vs "racing" bikes as they have far more clearance for mounting city sized tires and fenders and many come with eyelets for mounting racks. And as another "born again cyclist" welcome back. It's better the second time around! OK, that's a bit different. Apparently someone did add newer cross-type auxiliary levers to this bike and they are not the suicide levers I first envisioned. That makes me think better of the bike's quality. However, changing the bars, stem, shifters, etc. will still be expensive and leave you with the same 30 year old obsolete other components unless the bike had already been heavily upgraded there too. With out knowing the details of the bike as it now sits, my first recommendation to forego upgrading and get a newer bike still seems valid. Thanks for the reply. I'm 54 and more into the fitness aspect than racing. What about you? Although I just "ride around town" - I'll go out for 1.5-2 hours. I find I do not like turning my head up from the dropped bars and that is why I was more interested in a road frame and straight bars. How do you ride and what style bike do you use? If you are a lot more informed than me - How difficult would it be to have two sets of bars and switch them out? What do you think? 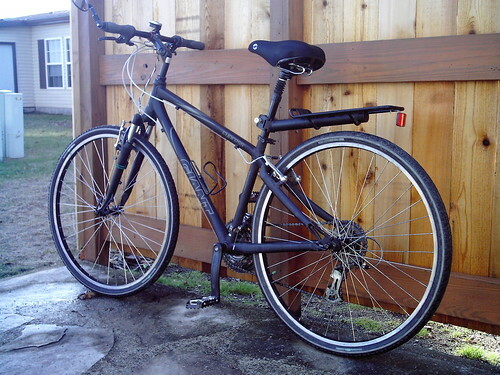 There are many nice bikes with 700c wheels that are great for fitness and have flat bars. Look at the Trek 7000 series bikes, Jamis Codas, Specialized also make a good cross bike but I can't remember the name at the moment. I was in Performance Bike Shop and they had some nice looking Scatantes (sp?) with flat bars. Why do you think they are expensive? From aebike.com: Kalloy stem - $15, Kalloy flat handlebar - $11, Falcon friction shifters - $10. Total: $36. Yes, if you change the handlebars, you'll have to change the cables and housing: $20. The OP first stated: "Just thinking about buying and assembling my own with quality components...."
I don't think any of what you listed qualifies as "quality components", particularly the Falcon shifters. 54 here as well. Recently it's been mostly commuting but I also enjoy a nice trail ride and even some light duty downhill. I try to go for a full day city "shopping" ride that takes me around all my favourite tool and bike stores but those have been rare the last couple of summers. Straight bars are nice for an easy going stance but I've always liked the drop bars for the variety of hand positions they give even if going into the drops isn't one I use a lot. I set my drop bars up with the upper bar about 1 inch below the saddle height and that lets me use the drops if I really must like in fighting storm winds head on to get home. I just fininished putting moustache bars on my single speed and I'm still playing with angles and stems to find that happy spot. But so far it's very promising. I also want to try bullhorn bars for the same reason. They've got my two favourite hand positions but without the drops to worry about. Switching out bars isn't that easy. Stems don't allways match (road and MTB bars have slightly different size grip areas) and the cables will allways be a different length and most road bike options involve bar tape with cable housings under the tape. Definetly play with everything and all the options for the first while and just use some electrical tape where needed to let you go for a ride. BUt work towards a setup you like and that offers some options and then tidy it all up with cables the right length and final bar taping if required and then just leave it. It's a lot less fuss that way. Oh, and if you can find some of the old bar end grips that can provide you with a "bullhorn" style setup that may work well for you. There's also some other oddball bars as well that go out and then back in. Traveller's bars or some such thing. Not sure of the name at the moment. Definetly hunt around for nicer bikes as you are able to find. Restoring an old and still fine classic doesn't need to break the bank and it's typically quite cheap to do as long as you can do your own tinkering. I've got an early 90's steel frame bike fixed up into a single speed (tried the fixed deal but I just can't wrap my brain around how not to kill myself with it) and it's one of the most fun bikes to ride that I've got. And up until I put long reach dual pivot brakes on it and replaced the chainring I had a paltry $120 or so involved in the whole bike. With the new parts I'm now slightly over $200. But the brakes sure are nice. 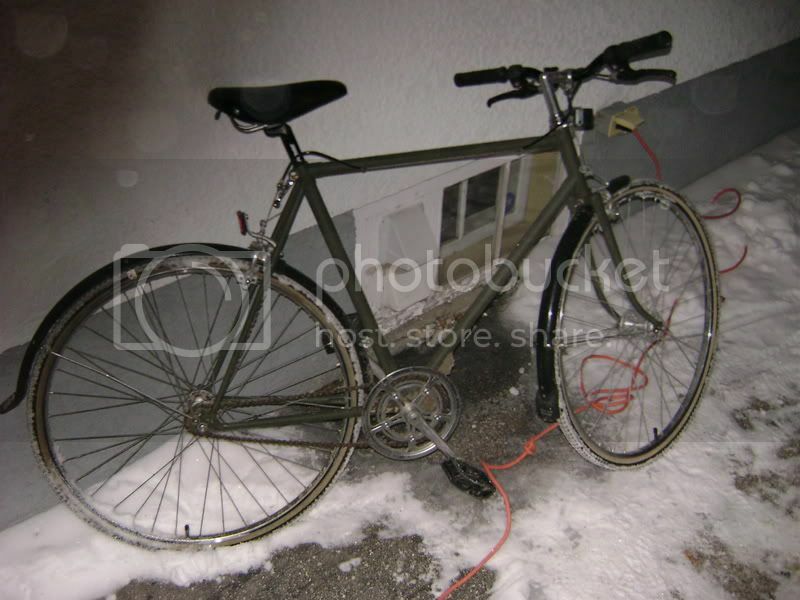 Or do you suggest to install 9-speed shifters + 9-speed cassette + new rear wheel + new rear derailleur. That's expensive, for sure. Last edited by Barabaika; 03-18-08 at 10:35 PM. I'm 52 and when I moved into the city I sold this and bought this. better for taking shortcuts. Great of you to post such a complete reply. It is always nice to know how others are doing things so as to onit a few mistakes and get ideas on how to proceed. I think I better get to a bike shop and sit on a couple road and urban/city/fitness/hybrid bikes to see what will work for me. 'Hope you can get back to your day-long rides this summer. I think I better get to a bike shop and sit on a couple road and urban/city/fitness/hybrid bikes to see what will work for me. In my opinion, that's the only way to go. When I went bike shopping a few weeks ago, I was surprised to find that some of my top choices just didn't feel right--but another bike did. You can study the statistics, wheelbases, geometry, component specs all you want, but in the end, the "feel" is the most important thing. For what it's worth, I bought a Trek 7.2 FX, which might work for you also. It has a flat handlebar, but the seating position still lets me lean forward a bit. I mostly ride for exercise, and it's been great for 10-20 mile rides around the countryside. (So far, I haven't tried it on longer rides.) But again, you'll have to try a few bikes in person; your experience may be different from mine. my favorite bike changes from day to day, but very often this one earns my admiration!!! I wonder why so many people convert nice old bikes to singlespeeds? I admit that old front derailleurs are very low tech and rub. But it's so nice to have a few cogs in the back. If you rebuild the rear wheel using a singlespeed hub, you can use a Tiagra hub for $30 as well. Then pick up a nice rear derailleur for $20-30, an 8 or 9-speed cassette for $20-30, and a right trigger or twist shifter for $20-30. That is pretty much my setup with my hybrid. Road frame with straight or MB bars. Keep in mind too that updating an old steed is fun from the tinkering aspect but when you do that you'll miss out on that precious "new bike smell". If it's not going to prevent you putting food in the cupboards then I'd say you deserve a new bike at our age. But having said that I know that we have to pick and choose where the money goes. With all due respect, I'm thinking that you don't get it. It's not about the money. It's about the satisfaction of doing it yourself. That trumps "new bike smell". I think it counts for something in Traderman's case too since all the indicators are there that this is one of the old waterpipe specials. Upgrading to a nicer all around bike at some point will be like a religious epiphany to him. I know it was for me when I went from the old water pipe special over to my first CrMo frame. Even then I tinkered with and did up the old steed until it was running as well as it could run. 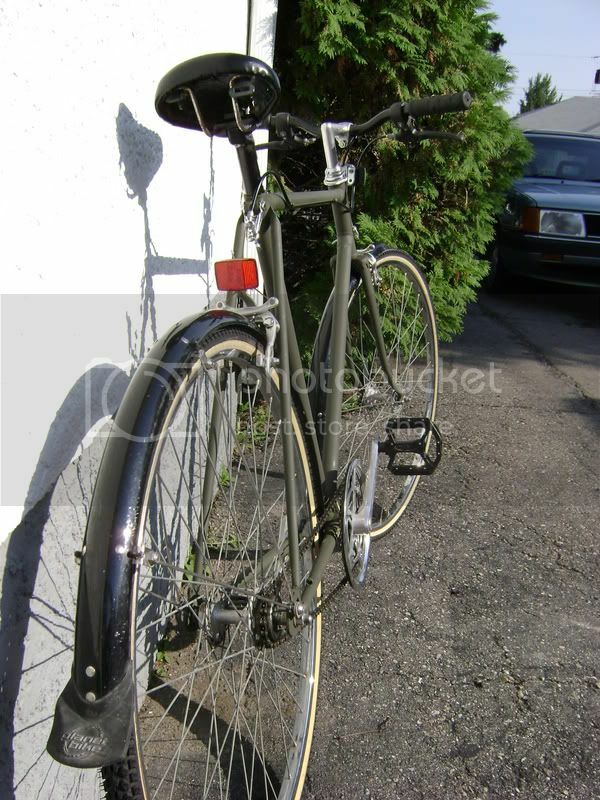 But it just never had the snap of the new bike and then I found and fixed up an older Miyata touring bike and realized that the old water pipe special would never be anything but a gut shot waterfowl. However all the time was well spent as it taught me more about what to look for and netted me an honest $60 when it sold at the consignment shop when other 10 speeds were going for typically $30 to $40.